One comes to a program of recovery from addiction when one is most vulnerable, reaching out for help. This does not mean, however, that one must sacrifice intellectual integrity or compromise individuality in order to achieve and maintain a life of sobriety. Studies of religions and cults have consistently proved that people tend to convert at times of great stress or failure in their lives. These are times when promises of enlightenment and cures for pain are most appealing. People don’t look for proof or evidence or even coherence in belief. They see someone throwing them a life-preserver, and they grab it. When you’ve lost faith in yourself, its only too easy to find it in something else. “Cognitive” means knowing, learning, perceiving. We look at the world and our lives in a rational way and try to understand the dynamics behind issues and events. The current “just say no” philosophy doesn’t help people very much. How could it? We are thinking beings. We need to know how, we want to know why. Simpleminded slogans don’t fulfill these basic human yearnings. Perhaps the pervasive repetition of such a slogan will convince a few that it is no longer popular to “get ripped;” then again, perhaps its dogmatic, self-righteous tone will have the opposite effect. All these things may very well be valuable and important, and I am not advocating that people just get sober and sit in a chair. But I am saying that one should not lose sight of the priority — which is sobriety, not goodness, not cosmic unity, not obedience to the will of a so-called higher power. It’s sobriety itself. Sobriety is a priority, but it’s not an obsession. It offers a kind of backdrop against which one can have a life, a meaningful life. If people want to just “be,” they can do that, too, and be sober; I have met such people. And I rejoice in their sobriety. Some “experts” on alcoholism feel that alcoholics can “unlearn” drinking behaviors and thus modify their intake. This is a ludicrous idea. I wonder, do they plan eventually to apply this approach to cocaine and heroin use as well? If an alcoholic chooses a life of sobriety, what has he or she lost in the process? Several years later, when I got sober again, I had a more difficult time of it. To wit: screaming and shaking and sweating and thinking that I was dying. My alcoholism had deepened profoundly, and I had abandoned my nonchalant attitude as well as my agreeable therapist. By so doing I abandoned the alcoholic’s most persistent nemesis: denial. Those seven months had merely been a “time out.” Visions of future drinks were dancing in my head. I had had no program, no strategies for (or commitment to) my sobriety. Now I do. In 1978, when I began my new period of sobriety, I was scared half to death. I have wanted to retain the positive essence of this experience as a way of maintaining a healthy respect for my arrested condition. I wanted a life of sobriety this time, not dreams of future drinks. And I was willing to do whatever was required to achieve that. During my first year of sobriety I questioned a number of sober alcoholics, searching for the common thread for their successes in maintaining a lasting sobriety. When I was about three years into my sobriety, I began to challenge some of the concepts of Alcoholics Anonymous, but felt that I stood alone in that endeavor. By the time I was sober for five years, I had compiled an extensive file of responses and, from four years ago to the present day I’ve collected data from more than two thousand “sobrietists.” Both from this research and from my own experience of recovery, I have put together a specific secular approach to achieving and maintaining long-term sobriety. I call it the “Sobriety Priority.” I wish to offer it here as a way (beware of anyone who offers the way) to achieve and maintain sobriety for life. With the Sobriety Priority, arresting one’s chemical addiction and staying sober becomes the top priority. It is separate from everything else in one’s life, including religious or spiritual beliefs. Rather than turning one’s life and will over to an outside force or higher power, recovering alcoholics and addicts credit themselves daily for achieving and maintaining sobriety, empowering themselves, rebuilding self-esteem, and building the best possible protection against relapse. This is not a “spiritual” or “twelve step” program. And it’s not a package deal. Achieving and maintaining sobriety is approached as a separate issue, not as part of a larger mystic/holistic plan that requires fear of one’s human imperfections. The Sobriety Priority method works. Thousands have used it successfully, not only for drug and alcohol addiction, but for other addictions, such as overeating and gambling. The Sobriety Priority approach for achieving and maintaining freedom from alcohol and other mind-altering drugs is a cognitive strategy. It can be applied, on a daily basis, as long as one lives, to prevent relapse. The Sobriety Priority approach respects the power of “nature” (genetic inheritance, physiological constitution) and of “nurture” (learned habit, behaviors, and associations)by showing how to achieve the initial arrest of cellular addiction and stave off the chronic habits that result from this addiction. 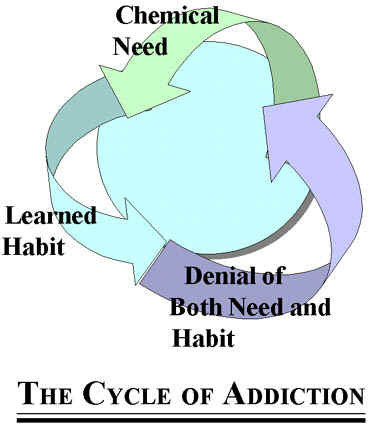 The “cycle of addiction” contains three debilitating elements: chemical need (at the physiological cellular level), learned habit (chronic drinking/using behavior and associations), and denial of both need and habit. The cycle of alcohol addiction usually develops over a period of years. Cycles have been found to be much shorter with other drugs, especially cocaine. In all cases, however, the addiction becomes “Priority One,” a separate issue from everything else. And as it progresses, it begins to negate everything else. The cycle of addiction can be successfully replaced by another cycle: the cycle of sobriety. This cycle contains three essential elements: acknowledgment of one’s addiction to alcohol or drugs (you may have euphemistically called it “a problem”); acceptance of one’s addiction; and prioritization of sobriety as the primary issue in one’s life. 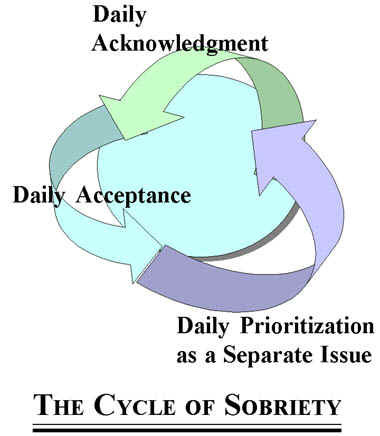 The daily cognitive application of a new “Priority One,” the Sobriety Priority, as a separate issue, arrests the cycle of addiction. It frees the sober alcoholic/addict to experience “everything else,” by teaching him or her to associate “everything else” with sobriety, not with drinking or using behaviors. The cycle of sobriety remains in place only so long as the sober alcoholic/addict cognitively chooses to continue to acknowledge the existence of his or her arrested addiction(s). The Sobriety Priority, applied daily, gradually weakens booze and drug associations, halting the cycle of addiction, allowing time for new associations to form as one experiences life without addictive chemicals. As one continues to “make peace” with the facts regarding his or her arrested addiction—that is, as one continues to recognize alcohol and drugs as a non-option—one comes to prefer a sober life-style; one longs to preserve it, to respect the arrested chemical addiction, and to protect the new, sober life. Portions of this brochure are excerpted from Unhooked: Staying Sober and Drug-Free (Prometheus Books, 1989) by James Christopher, founder of SOS. Publication of this material is made possible by support from SOS members and friends and by the Council for Secular Humanism, a nonprofit educational organization. Copies of this and other SOS brochures may be obtained from the SOS Clearinghouse. This brochure was updated January, 2000.